The Ozone Frenzy Landkiting and Snowkiting Foil Kite has a completely new design for 2015 combining the latest in foil and paragliding design technology. 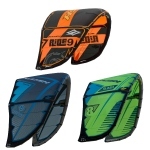 The Ozone Frenzy Foil Kite is a high performance freestyle kite aimed at intermediate to advanced snow and land kiters who are looking for performance and versatility. The Frenzy has massive pop, tight turn speed and crisp responsive handling. The Ozone Frenzy 2015 has been through a complete redesign, incorporating new technologies from Ozone’s world leading paraglider designs. The Frenzy is the ultimate land and snow Foil Kite for intermediate to advanced freestylers. Ozone Frenzy 2015 Construction: The Frenzy 2015 is constructed from top quality materials and now features a double pulley speed-system, utilising the latest high spec Ronstan Orbit Block Series 20 pulleys. Ozone have also added 3 unique “blow out valves” to the under surface to allow the internal volume of air to be released when the kite is crashed into the ground. The Ozone Frenzy has been the good friend of many Snowkiters across the globe and since its debut six years ago the Frenzy has set the standard. The new look 2015 is still the All-Terrain Frenzy we know and love. The new kite is a low down grunt kite which produces power just by putting it in the air but it is smoother, faster and lighter to handle. The Ozone Frenzy 2015 now comes with the technically advanced Ozone “Speed System” with a double pulley on each side that allows the angle of attack (D-Power) to be changed minutely which results in the smoothest progression from full power to full D-Power. Model - 14.0m Projected Area (cm) - 979 Flat Surface Area (sq m) - 13.0 Aspect Ratio - 4.17 Skill Level - Int/Exp Ozone Frenzy Control Bar System: The Contact-Snow Control System offers the latest in safety features, a clean control bar design and a simple easy-to-use trimming system. Push Away Quick Release – The control system features a new Megatron pushaway quick release safety with total flag out of the kite. The release handle is ergonomic with positive release forces (under 8kg) allowing for quick and easy release. Simple re-assembly saves time and gets you back up and riding faster. Three Safety Modes – The new Contact-Snow Control System offers riders a choice of three safety modes; the recommended Flag Out safety, or the optional Brake Handle or Suicide safety modes. The recommended Flag Out safety offers 100% flag out in all situations by releasing the Megatron or letting go of the bar when un-hooked. The Brake Handle safety method attaches the safety leash to the hand brake line that connects to the back leaders, when Megatron is released the kite stalls down to the ground.